The Global Volcanism Program has no activity reports for Morning. The Global Volcanism Program has no Weekly Reports available for Morning. The Global Volcanism Program has no Bulletin Reports available for Morning. Mount Morning is a glaciated, undissected alkalic shield volcano in the Erebus volcanic province SE of the south end of the Royal Society Range. An elongated 4.9 x 4.1 km caldera lies at the summit, and numerous parasitic lava domes and cinder cones formed on fissures on the N, NE, and SE flanks. The latest volcanism associated with growth of the phonolitic central volcano was Potassium-Argon dated at about 1.2 to 1 million years, and late-Pleistocene to zero-age Argon/Argon dates were obtained for some of the volumetrically dominant basanitic fissure vents. More than 50 morphologically youthful flank vents occur on the flanks. Kyle P R, 1977. (pers. comm.). Paulsen T S, Wilson T J, 2009. Structure and age of volcanic fissures on Mount Morning:a new constraint on Neogene to contemporary stress in the West Antarctic Rift, southern Victoria Land, Antarctica. Geol Soc Amer Bull, 121: 1071-1088. The Global Volcanism Program is not aware of any Holocene eruptions from Morning. If this volcano has had large eruptions (VEI >= 4) prior to 10,000 years ago, information might be found on the Morning page in the LaMEVE (Large Magnitude Explosive Volcanic Eruptions) database, a part of the Volcano Global Risk Identification and Analysis Project (VOGRIPA). There is no Deformation History data available for Morning. There is no Emissions History data available for Morning. Mount Morning shield volcano is seen in this aerial view from the NE. 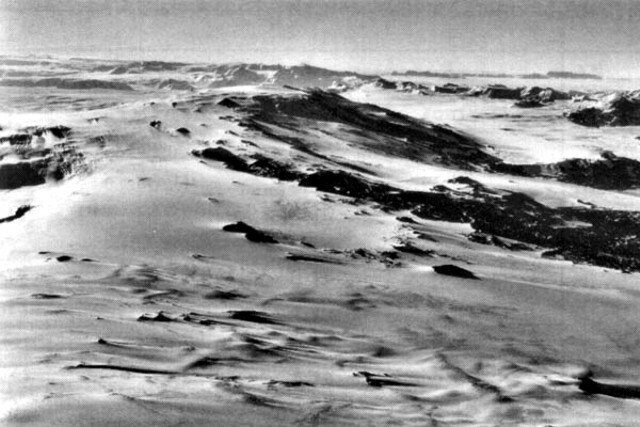 An ice-filled, elongated 4.9 x 4.1 km wide caldera lies at the 2723-m-high summit of the volcano. Numerous parasitic lava domes and flank cinder cones formed on fissures on Hurricane Ridge cutting across the NE flank at the middle right and on the Riviera Ridge beyond on the north flank. The Global Volcanism Program has no maps available for Morning. There are no samples for Morning in the Smithsonian's NMNH Department of Mineral Sciences Rock and Ore collection. Large Eruptions of Morning Information about large Quaternary eruptions (VEI >= 4) is cataloged in the Large Magnitude Explosive Volcanic Eruptions (LaMEVE) database of the Volcano Global Risk Identification and Analysis Project (VOGRIPA).